Today I delivered the paperwork for our taxes to the accountant, which is a major achievement. I decided I needed a small treat, so I allowed myself to do some cutting for my next leader and ender project. I was mildly intrigued by the block, and drew up something similar in EQ6, and fiddled and mucked about a bit. I decide it would be nice pieced as scrap, and I played with settings and different piecing methods until I came up with about 16 variations. Then I made a sample block, and liked it, and decided it would be the block to use up all my remnant 2 1/2" strips. 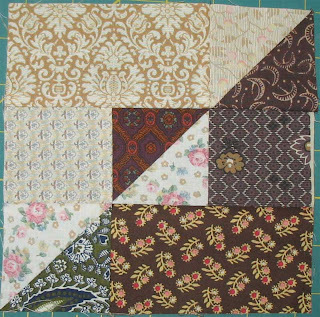 This is what I've been piecing: it's my ideal block. For each one I make 3 half square triangle units, a dark and a light 2 1/2" square, and a dark and a light 2 1/2" x 4 1/2" rectangle. It's so easy, especially as I have most of these precut and leftover from other projects. 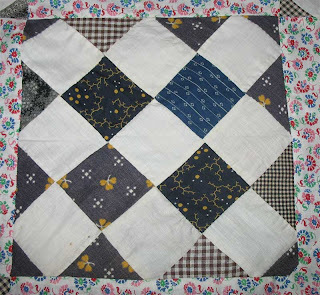 Then I went reading on the Maverick ring, and realised that what I had laboured over in EQ6 was virtually the same thing that Bonnie was making with her baby quilt. Doh! But I still like my blocks, and all the variations I drew up, and I'm piling up the blocks. They are a delight to piece, and they are using up those leftover 2 1/2" strips. 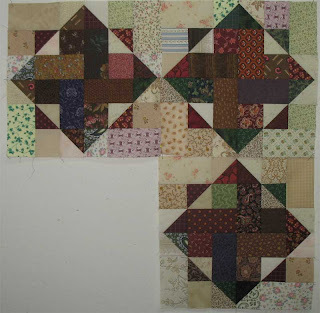 I like it on point as well, so I may just amass a huge amount of these blocks and make several quilts. I haven't abandoned the Maverick Stars, but I'm trying to decide on a setting before I forge ahead. And I have discovered that I dislike crumb piecing and using up odd-shaped scraps. It's too disordered for me, it causes me real anxiety. 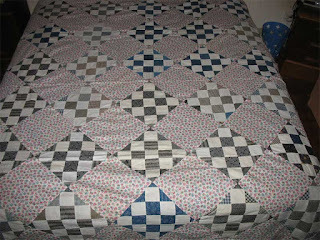 I guess once I get rid of this lot of scraps I won't make another quilt like this. I will donate all the odd shaped bits to someone who actually enjoys working with them. Blame any spelling mistakes in this post on my latest craze; DH came home from the pub extolling the virtues of Gin & Tonic. Whatever, I thought, but he bought all the fixings and made me one. Hmmm, I thought, that isn't bad. I have read so many autobiographies of British expatiates in the tropics, and Gin and Tonic seemed to be the drink of choice. I live in the Tropics. Therefore I should drink Gin and Tonic. It makes sense to me...... It's a very complex blend of flavours, and I haven't tired of it yet. I do like discovering things that I like. For years we ate very mediocre meals because that was all we could afford, or the kids wouldn't eat anything except boiled pasta and steak and gravy. Now we are discovering a whole world of fantastic flavours and tastes, and it's fun. I have lived on spinach, feta cheese and sun-dried tomatoes for the last 6 months, washed down with red wine. Mmmmm! The weekend was not very productive, but extremely relaxing, and a most welcome change of pace. 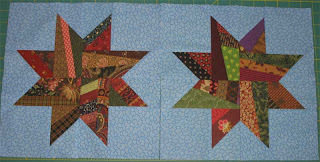 I worked on some more Maverick Stars, finetuning the pattern to make it easier to piece. I don't mind set-in seams, but I need a project that won't take forever to piece, so I've changed the size and the way I'm piecing it. The block goes together really fast, with no awkward spots, and I'm happy with how the finished blocks are looking. Now for the perrenial question, what size d oI make this thing? My goal is to completely empty three small scrap containers like the ones shown. I've been hoarding some of these bits for 10 years and I'm sick of them. My problem when I finally come to use the saved scraps is that I try to conserve them, use up every last little thread, and that's not the aim of the game. I need to use them up and throw away the leftover bits and move on. Not agonise how I can get two teeny bits out of a mere snippet; use another snippet and get on with it! If I don't maintain some sort of pace then I get mired down worrying which way is the most economic use of fabric and then I go and clean out the Tupperware cupboard instead because it's all too hard. I had an extremely stressful week, which I declared officially ended as I hefted the last parcel onto the counter at the Post Office. I do love getting big orders from shops, but I like to have more than 2 days notice! And three enormous orders in one week was a record. Meredith and I swap a list of short-term goals each week, in an attempt to make us more focussed on what we need to be doing. Sad to say, my list is often the same for a month or more. I rarely get to cross everything off, even though they are all worthy items. I need some motivation. 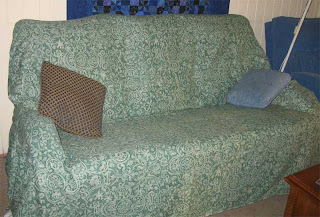 I did manage to finish the couch cover, which involved a bit of muscle as it was very thick decorator fabric and rather heavy when it was all in one piece. I've decided that when I get my current list finished (20 items, but some are very tiny goals) I am going to allow myself to join a fabric club, probably a Judy Rothermel Civil War one. I have been virtually no-buy for 5 months now, and I don't miss the stash acquisition at all. In fact, as I am now doing my taxes and totting up all the fabric purchases from the year before, I am very relieved that I haven't spent any more on material. But I need something affirmative in my life, I seem to be working 10 hours a day lately. Working with my current stash is not very exciting, so a little infusion of Judy's wonderful range of reproductions would maybe pique my interest. First I have to get busy crossing things off the list. Post blog entry - check!! 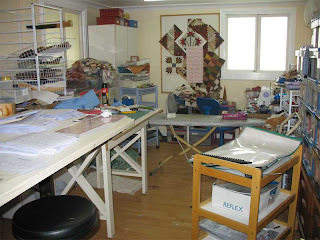 An interim photo of the sewing room, clean-up in progress. I've cleared away a lot of the clutter and fabric, sorted the scraps and put away the sewing tools. I need to reorganise the storage though, as I can't get to the cupboard where the strips of fabric are stored, and I need to change that. But there will be sewing taking place very soon, which will be a major achievement, even though it will only be turning the 7 metres of fabric on the floor there into a couch cover for the lounge room. It's on my list of things to do, and it will get that big wad of material out of the room and off my concsience. 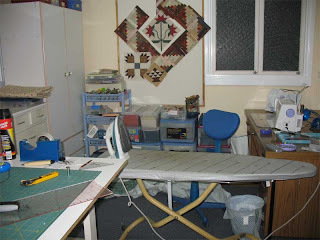 Mereth was talking about her 'Never Again' sewing moment in this post; my personal moment was 15 years ago when I was asked to make 17 pairs of 'Happy Pants' for a bowling team, 9 men and 8 women. They were simple elastisized pants, with side pockets, but the material chosen was a wool/polyester plaid in a very large assymetrical check, which meant it was a pig to cut out and match the lines. Then they bought a single copy of a woman's pants pattern, which meant I had to cut out all the larger sizes first, then cut the pattern down for each smaller size, destroying the pattern in the process so I had to get it right first time. And I had to recut all the pieces for the men because they didn't want the waist as high as the ladies pants. I had to measure all 17 people in the lunch room at the bowling club, and taking the inside leg measurement of 9 strange men in public is not my idea of fun. The whole thing was a disaster, and I vowed that I would never again sew clothing for other people. I thought that the whole incident was lost to everyone's memory, thankfully, until two years ago when my daughter was having driving lessons. She parked outside the house, and her driving instructor got out of the car and said 'You made happy pants for us' and I could have died. Let's draw a veil over that whole sorry episode. Last weekend while cleaning up the yard I noticed something half-buried in the ground under the trees; I couldn't believe that it was a scrap of the revolting plaid from those pants. It's haunting me. I'm running on the spot here, trying to get all my work finished before the end of the week, so I can have the weekend to do whatever I want. I have to go to Bunnings (big hardware place) because I'm having withdrawal symptoms and need to buy some plants and herbs for the garden. I need to spend time in the garden making all the surviving plants comfortable so they can withstand the last blast of hot weather (it's worse now than it has been for most of the summer). I need to visit the fabric shop for upholstery supplies, and the supermarket for vittels for the young'un. And tonight I'm going to the bottle-shop for my stock of red wine, which helps me take a relaxed view of life. I'm so glad the scientist s have agreed that a glass, or two, a day is good for one's health. It's good for my soul as well. 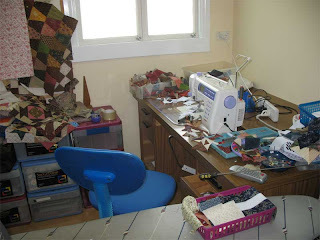 I wouldn't normally post 'before' pictures of my sewing room, but I will this time, in the hope that it will make me prioritise the cleaning up. It's going to be a huge relief to see some order in here, so that I can sew in peace and tranquility. I don't like to sew when things aren't functional and nicely laid out; half the fun for me is being organised and orderly. We have survived the first week of Uni, and I even made it to the gym on two separate occasions. I do weights and an hour on the treadmill at home, but it's good to get to the gym and do some more comprehensive exercises. I'm aiming for three times next week, and as DS has classes every single day I just have to pick the most convenient times to slot in a gym visit. The thing that keeps me wanting to exercise is reading; I only ever allow myself to read while on the treadmill or at the gym, so I look forward to both the exercise and the reading. Cunning plan, ey? 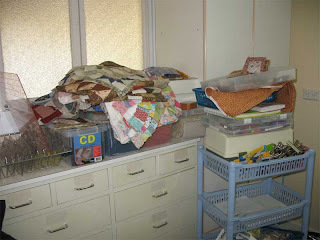 Tonight, after my hour of reading/running, I will be sorting out those tottering stacks of material and scraps and quilt tops, which is the first step in th e sewing room cleanup. 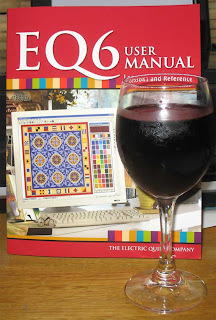 A little light music, and a glass of red wine and I'll be all set to enjoy the start of the weekend. 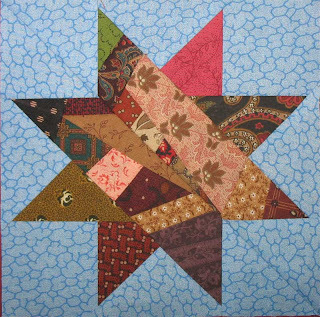 I decided it's time I do a truly maverick quilt, and diso bey some of the quilting rules. 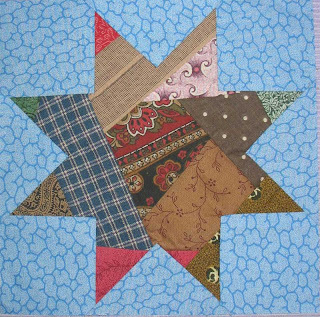 So I'm making these star blocks out of every last little scrap and nibble of my antique reproductions. I've wanted to do a quilt with a Lancaster Blue background for years, but I've never been brave enough to cut into my hoard of the stuff. But now is the time. I'm loving how these are turning out,, but I haven't decided on a final pattern yet. The first one is paper pieced and has set in seams, which was OK, but a little cumbersome at the end. The second one has an extra seam through the diagonal and is pieced in two halves, allowing it to be entirely paper pieced with no set in seams. I don't know which one I prefer yet, so I will have to make a few more and then decide. They are so much fun, and I'm going to love the look of the final quilt. I went through some upstairs cupboards and found some tins of ancient UFOs, more than 15 years old and all hand pieced. They will sit by my chair in the loungeroom and I'll get the pieces put together and then use them in my orphan block quilt. I can safely say that if I haven't touched them in 15 years then I don't really want to finish them as I had originally planned. 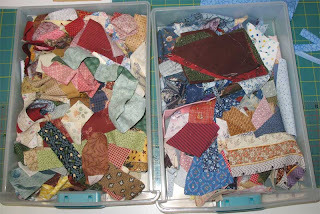 It's better that the pieces end up in a sampler quilt than languish in the tin for another 15 years.